First off, this thing is loaded with features that the final version didn't have. Second off, this thing is loaded with features that the final version didn't have. Check it out: 3 safe-firing spring rockets (two short ones and one long one), LED lights in the chest plate, removable arm flame thrower, removable dart weapon, electronic sound and knee darts. I guess this would have blown their budget so they scrapped just about all of it and left one rocket that was removable and attached the flame thrower on the arm. Notice the gun on this version is much smaller than the production one. The sculpting is 100% different also. There's no way to know if this mock-up had all these features or not, but I think the coveted rocket-firing action figure prototypes almost pale in comparison. With lights and sound this thing is more reminicent of the deluxe 1998 version than the 1979 toy. Speaking of the 1990's, the hands here have half-circles on them. As a side note, this exact photo was also used on an early mock-up of the Boba Fett bell hanger display. 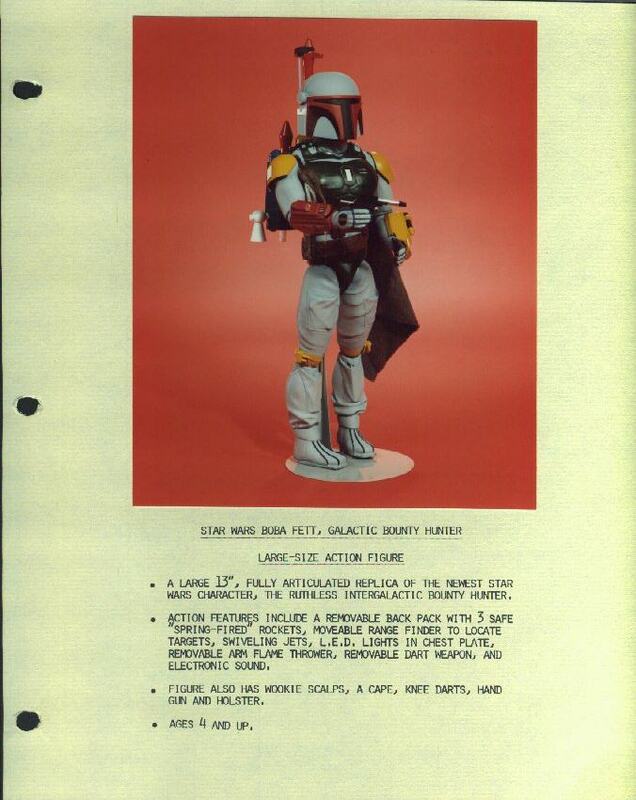 It was used to showcase the standard Boba Fett action figure.